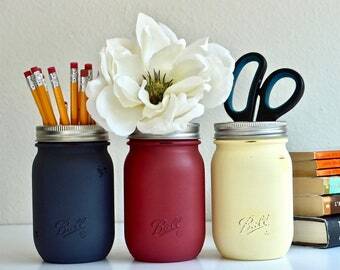 These beautiful painted mason jars are ideal for pencil holders or fresh flowers and water. 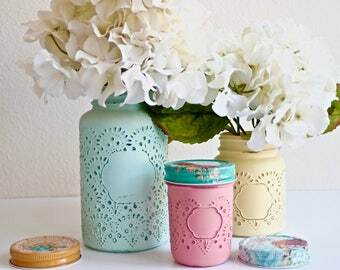 They are painted on the outside only and are slightly distressed on the front and back of the jars (except largest jar). This listing is for 4 jars. 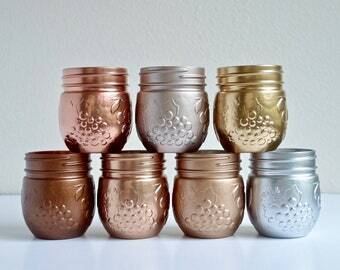 The quart size metallic jar is 6 1/2" tall. 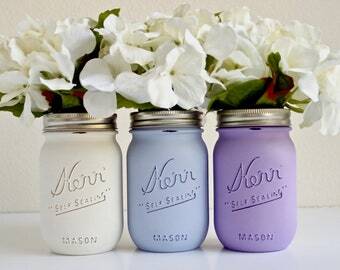 The 3 pint jars are 4 1/2" tall. 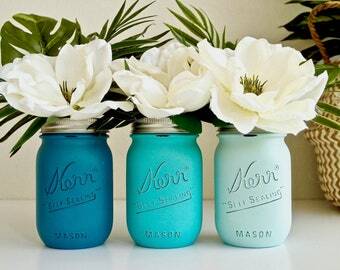 Beach Blues is home of the original painted and distressed mason jars since 2011. This is a one of a kind and unique color combination created by me. As of May, 2016, no other shop has this combination. 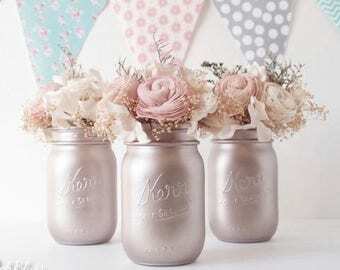 THE JARS ARE SPRAYED ON THE OUTSIDE WITH A WATER-RESISTANT ENAMEL, SO YOU MAY CLEAN THEM WITH A DAMP CLOTH, HOWEVER, SUBMERGING THEM IN WATER OR PLACING THEM IN THE DISHWASHER IS NOT RECOMMENDED. Flowers and utensils are not included in this sale. 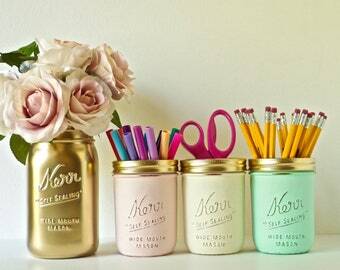 I absolutely LOVE LOVE LOVE these jars!!! They’re gorgeous and I am so happy with how they came out!!! They look so perfect in my office!!! Thank you!!!! 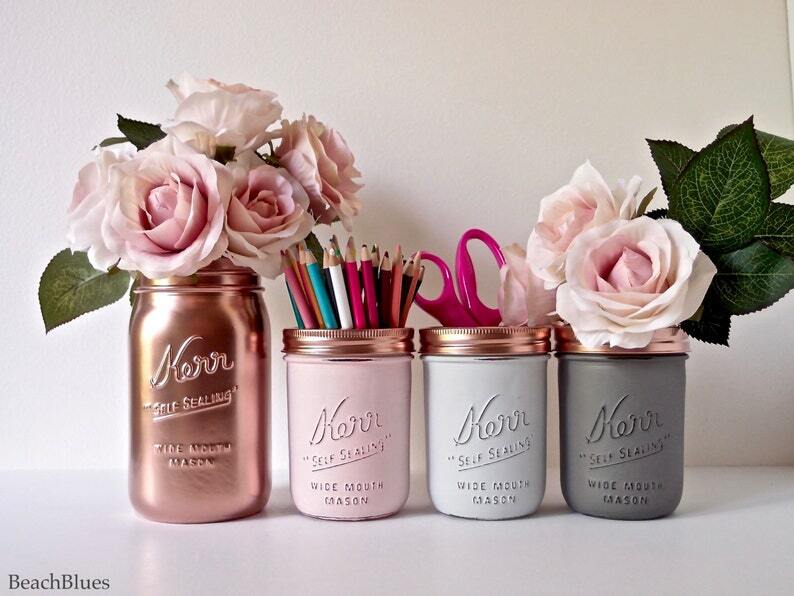 High quality beautiful little jars. Love them! I accept PayPal and major credit cards through Etsy only. If an item is broken or damaged, please let me know as soon as possible. You will need to take a picture of the item before I can issue you a refund. If you would like to exchange an item, you can send it back to me and I will send you a new item. Shipping to and from buyer for exchanges will be at buyer expense. If the buyer needs to cancel an order, please do so within the first 24 hours of ordering. After that, buyer is responsible for shipping costs as well as returning the item. I can issue the buyer a refund if I receive the item back, however, shipping will be at buyer expense. I accept returned items in their original condition only up until 30 days after purchase. DOMESTIC ORDERS: I ship everything to the States USPS PRIORITY to ensure items are handled with care and that they reach you in a timely manner. I do not ship parcels "book rate", "parcel post" or "parcel select ground" because I need to insure that they will arrive without harm and those options are not insured. This priority option includes insurance to reimburse the shipping to me for re-shipment in the event that a package is damaged. I will always give you a tracking number on the day your item is shipped. Shipping usually takes 2-3 days depending on which state you live in. Please convo me if you have multiple orders. I will calculate shipping for you before you place the order. INTERNATIONAL ORDERS: Any parcel over 4 lbs. MUST be shipped USPS PRIORITY. There is not another option. This is the absolute cheapest way possible to send international parcels. Any parcel under 4 lbs. is shipped First Class International. I will provide you with a tracking number that is found on the customs form. Shipping takes 6-10 business days. I AM NOT RESPONSIBLE FOR ANY CUSTOMS TAXES THAT ARE INCURRED TO YOU BY YOUR COUNTRY AT THE TIME YOU PICK UP YOUR PARCEL. THAT IS A TAX THAT IS INCURRED BY YOUR COUNTRY AND HAS NOTHING TO DO WITH ETSY, MY SHOP OR THE SHIPPING CHARGES THAT YOU PAY TO ME. I AM NOT RESPONSIBLE FOR LOST PACKAGES DUE TO AN INVALID ADDRESS OR BECAUSE OF POST OFFICE ERROR. I WILL SHIP ALL ORDERS WITH THE ADDRESS GIVEN AT THE TIME OF PAYMENT. ANY LOST ORDERS ARE THE RESPONSIBILITY OF THE BUYER AND THE IF THE BUYER WANTS A REPLACEMENT, THEY CAN DO SO AT THEIR OWN EXPENSE. I AM NOT RESPONSIBLE FOR PAYING THE SHIPPING ON A RETURNED PACKAGE DUE TO INVALID ADDRESS OR POST OFFICE ERROR. I'M NOT RESPONSIBLE FOR ANY PARCELS THAT INDICATE THEY ARE DELIVERED AND YET THE BUYER DIDN'T RECEIVE THEM. IF YOUR ITEMS ARE DAMAGED, I AM HAPPY TO REPLACE THEM IF YOU EMAIL ME A PHOTO OF THE DAMAGED ITEM. HOWEVER, IF YOUR PACKAGE IS LOST, I AM NOT RESPONSIBLE FOR REPLACING IT. NO DROPSHIPPERS ARE ALLOWED TO RESELL MY PRODUCTS ON THEIR WEBSITE. I DO NOT GIVE PERMISSION FOR THIS. If you need your jars rushed to you quicker than the normal turnaround time, I have a $10 rush fee. For orders of 20-25 jars, I will need 30 days notice. For orders of 25-30, I will need 45 days notice. For orders more than 30 jars, I will need a 60 day notice. Any large orders that are needed faster than those time frames will be charged a $10 rush fee. The fee will be included in your custom order. I always welcome custom orders! If you would like to mix and match colors, please convo me and I will be happy to do this! If you order multiple sets, please convo me and I will calculate shipping for you. Otherwise, if there are shipping overages that you have paid, I will refund that money to you. 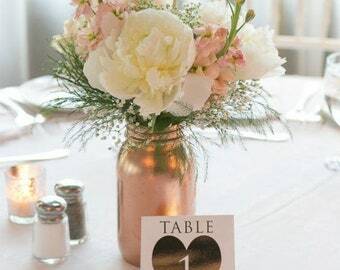 If you plan to re-sell my jars at your boutique, I will gladly send business cards with the shipment so that you can include them in your shop. You can only use my photos with my permission and you must include a link to my shop or website if you do so in your blog, website, Facebook page or other media. 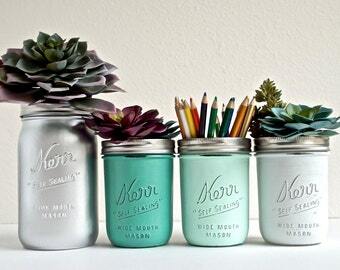 YOU MAY NOT RESELL MY JARS AS YOUR OWN CREATION. THIS IS NOT LAWFUL. For hand-painted items, please do not place in dishwasher or submerge in water. You may use a damp or dry cloth to wipe. For metallic painted jars or bottles, please handle with caution and pick up using inside rim of the jar so as not to scratch the outside. 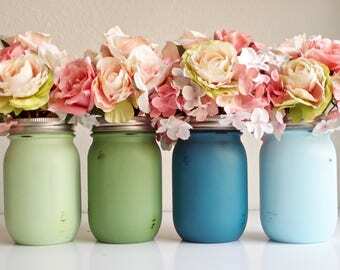 Inside painted jars cannot hold water because it will cause the paint to peel. I do not sell wholesale and do not give permission for drop shipping. I only gift wrap around Christmas time. I'm almost always at a 3 week turnaround time due to high order volume. Shipping takes 2-3 days for US states. You should receive your order about 24 days from the day you purchased it. If you need you order sooner, I do have a rush fee of $10 that puts your order at the front of the line. You will receive it within 7-10 days from the date of purchase.